LITTLE ROCK, Ark. - April 26, 2016 - With friends and family standing next to him in victory lane, Jason Sides exited his car after scoring the World of Outlaws Craftsman® Sprint Car Series win on Tuesday night at I-30 Speedway in Little Rock, Ark. The victory, his first since night one of the Boothill Showdown at Dodge City Raceway Park in July 2015, was especially memorable for Sides, who is just over a two hour drive from his hometown of Bartlett, Tenn.
"I am glad everyone made it over from the Memphis, Tenn. area," Sides said. "I guess Pevely (Federated Auto Parts Raceway at I-55) is the next closest to home, but this is our home track now and I just appreciate everybody coming out on a Tuesday night." In the closing laps of the 40-lap feature, Sides had to hold off a late race charge from the Big Game Tree Stands/Nyce Crete & Landis No. 5 of David Gravel, who had overcame a deficit of over a second to get to Sides' back bumper. Gravel, who tried a last lap dive bomb for the lead, came up just short and settled for a second-place finish. "I thought we had something for him," Gravel said. "A couple more laps with those lapped cars and we maybe could've gotten him. But we will take a second, it was a good run for us and we will see what happens in the future. "We were just trying to do some things different. Sometimes people get too tentative and just run around the bottom, so you just got to keep your momentum up and keep your wing speed up." "I was probably Jason's biggest fan there the last four laps cheering him on. I knew this would be a pretty big win for him, obviously being from close to here, and one of his home tracks. Pretty cool to see him win in front of all the people he has here - his friends and family." To start the night, Gravel's CJB Motorsports teammate and World of Outlaws champion, Sammy Swindell, set quick-time at the track he has won at three times in series action: twice in 1981 and again in 1992. Swindell continued his early-night dominance as he led every lap of his heat race and easily earned a spot in the dash. Oklahoma driver, Brady Bacon, won the dash, which gave him the best view of the green flag for the feature. Unfortunately for Bacon, he lost the lead to the King Racing Products/East Coast Logistics No. 7S of Sides on the opening lap, as the second-place starter easily rocketed to the top spot. Sides dominated the feature as he led all 40 laps, the victory did not come easy for the 43-year-old driver. Multiple cautions early in the feature never allowed the leader to build up a lead, but also kept Sides from encountering heavy lapped traffic at the 1/4-mile track. Sides held off challenges from Bacon on the early restarts, then had to fight off challenges from Pittman in the No. 9 Great Clips/Sage Fruit car, who had started third and stayed glued to the front of the field all race long. "The caution flags hurt and helped, I hated the restarts but it kept us out of lapped traffic," Sides said. "I didn't know [David Gravel] was out there in the closing laps. I saw Daryn [Pittman] on the restarts but I never knew that [David] Gravel got by him on the restart. "That's good for him, but I am just happy we got the win here. It's as close as we get to home, and I love this place!" Gravel tried everything he could to rattle Sides for the lead, but Sides held firm at the front of the field, as Gravel settled for second, his first podium finish since Bakersfield (Calif.) Speedway on April 15. "You can't complain with second," Gravel said. "We had a really good car there early, it got tight and scared me a little bit, but I got a few more laps under me and got more confident. "We got a little free in one and two on those last three laps. We had something there but came up just a little bit short. It really would've been good to get a win there. My buddy Tyler back home got in a real bad car accident and he's still in a coma, so we were trying to get a win here for him but we will get one soon." "It was a good race, we kept making gains on our car all night," Pittman said. "This is a track I have never had a lot of success at, so we were able to run up front and contend for the win. "That last restart we kind of got pinched on the bottom and just didn't get a good start and got beat, and then [David] Gravel got by us. The car just went away on us a little bit at the end, but all-in-all a great night for our Great Clips team. We will take third and go on to Friday. [Salina Highbanks Speedway] is a really cool track and one that I look forward to going to and hopefully we will be able to improve a few spots there." The World of Outlaws Craftsman® Sprint Car Series make their annual return to north eastern Oklahoma, as they travel to Salina Highbanks Speedway on Friday, April 29. 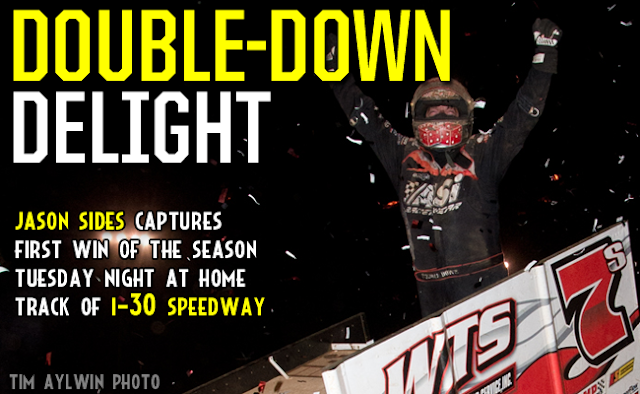 For ticket purchasing options and event information visit www.WoOSprint.com/Salina-Highbanks-Speedway. RACE NOTES: Jason Sides, leading his first laps of the season, became the eighth different winner in 20 races in 2016...Daryn Pittman tied teammate Brad Sweet with most podium finishes at 11 on the season...David Gravel ties Jason Johnson with third most heat wins on the season at seven. CONTINGENCY WINNERS - MSD Ignitions ($25 cash): Jacob Allen; MSD Ignitions ($50 cash): Jason Sides; Penske Shocks ($50 cash): Donny Schatz; JE Pistons ($50 cash): Brad Sweet; VP Racing Fuels ($50 cash): Joey Saldana; Edelbrock ($50 cash): Shane Stewart; Comp Cams ($50 cash): Shane Stewart; Morton Buildings ($50 cash): Paul McMahan; Cometic Gasket ($50 cash): Greg Wilson; Super Flow ($50 cash): Greg Wilson; Craftsman/Sears ($100 cash): Brady Bacon;KSE Racing Products ($100 product certificate): N/A; Comp Cams ($50 product certificate): Jason Sides; JE Pistons (Set of Rings): Aaron Reutzel; JE Pistons (Set of Rings): Jason Johnson. SEASON WINNERS: Donny Schatz - 5 (Volusia Speedway Park on Feb. 14, The Dirt Track at Las Vegas on March 4, Stockton Dirt Track on March 18, Stockton Dirt Track on March 19, Silver Dollar Speedway on April 2); Brad Sweet - 5 (Volusia Speedway Park on Feb. 13, Volusia Speedway Park on Feb. 14, Cotton Bowl Speedway on Feb. 26, Ocean Speedway on April 1, Bakersfield Speedway on April 15); Daryn Pittman - 3 (Royal Purple Raceway on Feb. 27, Perris Auto Speedway on April 16, USA Raceway on April 18); Joey Saldana - 2 (The Dirt Track at Las Vegas on March 3, Devil's Bowl Speedway on April 22); Shane Stewart - 2 (Arizona Speedway on March 6, Devil's Bowl Speedway on April 23); David Gravel - 1 (Thunderbowl Raceway on March 12); Jason Johnson - 1 (Placerville Speedway on March 24); Jason Sides - 1 (I-30 Speedway on April 26). World of Outlaws Craftsman® Sprint Car Series Statistical Report; I-30 Speedway; Little Rock, Ark. ; April 26, 2016.